Patrick McGuire grew up in the Pittsburgh, PA area but came to the NorthWest sometime around the turn of the century when he was invited to perform at the first ever Portland Juggling Festival at Reed College. He has long since settled there but spends much of the year traveling with Cirque du Soleil. It was with Cirque that Patrick toured around the world in over 2000 shows with two of Cirque du Soleil’s most praised productions, Mystère, in Las Vegas, and Quidam, on its original North American tour. 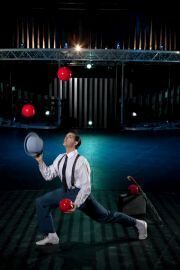 Beginning in 2010 Patrick returned to Quidam as the Papa character as well as his manipulation and juggling act.